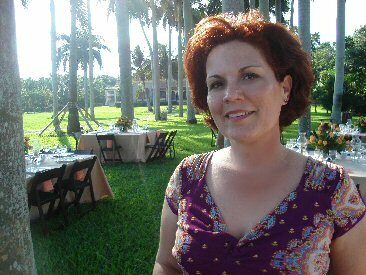 Desiree Munera of Desired Events - Bride Craft Interview! Interview: Desiree of Desired Events! Bride Craft interviews the creative force behind Desired Events, Desiree Munera. With decades of experience under her belt, we hope our DIY and Budget Brides will get a lot out of her valuable advice! Bride Craft Question: So Desiree, when did you decide that the wedding industry was for you? How did you get your start in wedding flowers? Desiree/Desired Events Answer: Back in 1998 I was working as a Floral Designer and the company decided to cross train some of their employees as Wedding Specialists. I was selected first to go thru the process, so I got the opportunity to work in the Wedding Department. I fell in love with all the little details and not-so-little details that created these beautiful bouquets, wedding centerpieces, arch arrangements, etc. All the emotion involved in the creation and especially that moment when you see that Bride’s look of happiness. I’ve loved the wedding business from the start! BC Q: As a Wedding Professional, how do you feel about the DIY wedding movement that has emerged? Desiree/DE A: I have mixed feelings. I’ve seen great ideas and finished pieces created. Specifically I’ve seen beautiful DIY table numbers, place cards, invitations and favors. And other great ideas and not so great ideas with horrible final products that make you cringe. It’s understandable that with the economy that more brides and their families are working on DIY wedding. Still try to consult with a professional, though. It will make your life a little easier to have a pro’s guidance and things are more likely to come out looking beautiful. One good resource is an experienced Wedding Planner; they offer consultations services for a minimal fee that will save you a lot of money in the long run. BC Q:Desiree, since you have a both wedding planning and wedding florals under your belt, tell us how you feel specifically about Brides (or their respective loved ones) making their own wedding flower arrangements? Desiree/DE A: It all depends on what type of flowers and the logistics! If you’re going to DIY Wedding Flowers, then care that the flowers require is priority. Don’t choose hard to handle blooms like Oriental Lilies that can take days to open and have messy pollen that can stain clothes and hands. Go for something simpler like Hydrangeas and Roses. Then consider the time that it will take to make the arrangement. Don’t forget the storage space the pieces will require. You have to think the whole process through. Do your homework first and do trial runs to see how comfortable and confident you will be about DIYing these delicate wedding day essentials. If it makes sense and won’t be too difficult (and you’re gotten great advice from a well seasoned pro about your choices and ideas), then dive in and enjoy the creative process! BC Q: What do you feel is the best case scenario for DIY wedding flowers? Desiree/DE A: . The Best case scenario is when you have asked a professional, done your homework, practice and it looks like a professional made it! BC Q:What could the worst case scenario (ie, nightmare situations) be? Desiree/DE A: The worst scenario could be flowers dying because of improper storage and refrigeration. Proper transportation (centerpieces in the trunk, heat) having to do your own set up with not enough time. Flowers not arriving on time. So many things can go wrong. I always say it’s not worth the stress! Leave it to the professionals if your budget allows. Otherwise, keep it sweet and simple. BC Q: So what’s your best advice on saving money with professional wedding flowers if clients decide they don’t want to go the DIY route with their bridal buds? Desiree/DE A: Go seasonal! It doesn’t mean they will be cheap flowers. But they’ll be more reasonably priced if they are in season as opposed to out of season. For example, peonies in season are $2-3 dollars each stem. Out of season they can run about $5-6. Check what colors are available for each season, sometimes a particular color of flower is not available. Another thought for saving a bit is featuring one or 2 larger flowers in your centerpieces. These flowers are going to be your focal point and can be accented with less expensive filler flowers (such as aster solidago, caspia, etc). And ask more of your flowers! Let your arrangements multi-task for your wedding. If you are having flowers in the ceremony take them with you and utilize them on your sweetheart table, cake table, etc. Ask a family member to transport them for you. BC Q: And if they DO decide to create DIY flowers? What is your best advice for pulling it off? Desiree/DE A: Do your homework, ask a professional, practice and keep it simple & elegant! Preparing is the key. Do samples, test things out! BC W: And as an ending, would you tell us your favorite thing about working with weddings? Desiree/DE A: Like I said before, it’s the Brides look of happiness. It is truly priceless to know you played some part in creating these moments of joy. And it’s always a pleasure to be referred to a client’s friends and family because they thought so highly of your skills. Good luck to all of those engaged couples working on creating that special day!